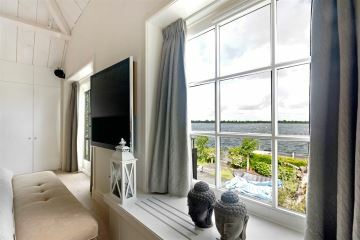 We are selling a breath taking villa on the Baambrugse Zuwe, on the shores of the Vinkeveense plassen. 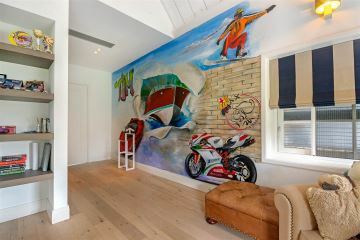 The villa of no less than 607 M2 (!) 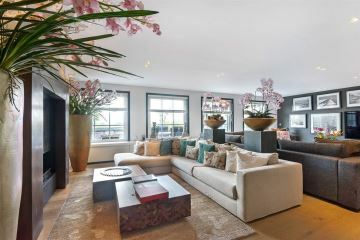 of living space has been maintained in more than perfect condition. 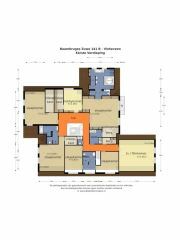 It not only has 14 rooms in total, 5 of which bedrooms, but it also has a garden surrounding it. It is directly at the shores of the Vinkeveense plassen, with a boat house, outside kitchen, Jacuzzi and a plunge pool. 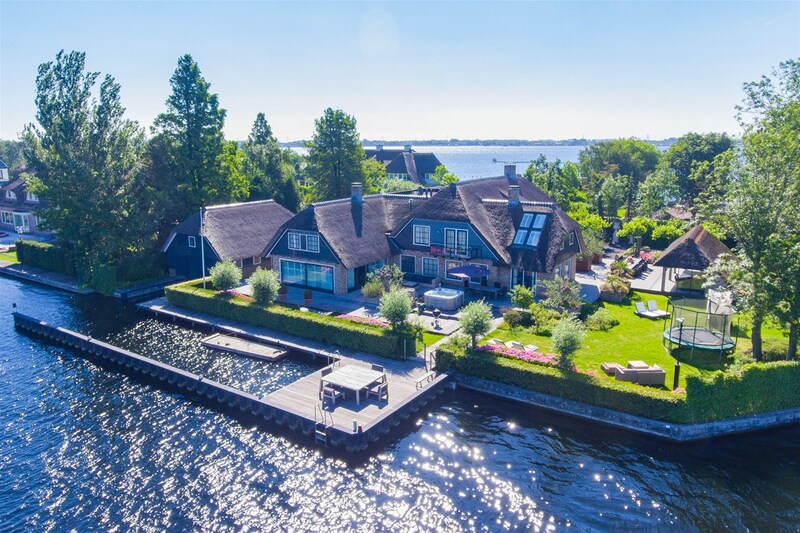 The jetty on the water, with convenient ladders and a springboard make swimming in this �natural pool� most comfortable, and it is also large enough to serve as a sitting terrace. 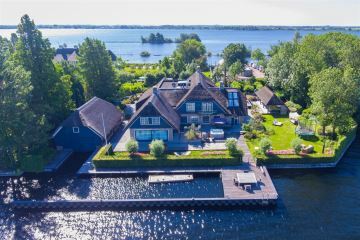 Whichever the season, this unique living location with its relaxing views of the marshes and open water of the lake, provides an ultimate vacationing feeling all year round. 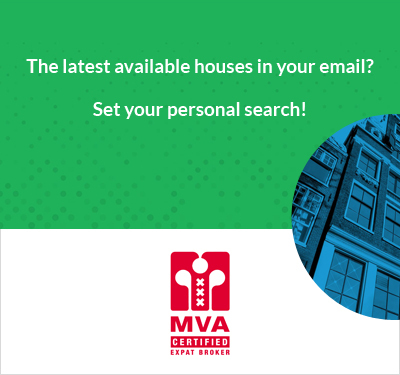 And all that at a 15 minute drive from Amsterdam�s Zuidas business district. 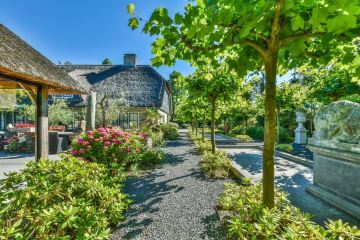 The thatched villa is entirely renovated in 2012 and provided with a large number of luxury accessories and security equipment (16 cameras). The exterior was painted in 2016. 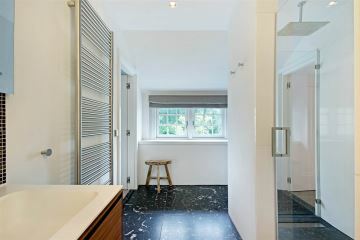 All the materials used inside the house are of excellent quality and almost entirely custom-made. 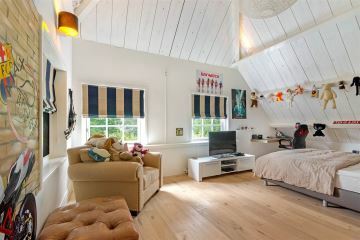 There is floor heating throughout the entire house, air conditioning, double windows, superior sound system by B&O and intercom. After crossing a small bridge over a narrow canal, the wooden gate opens via remote control. 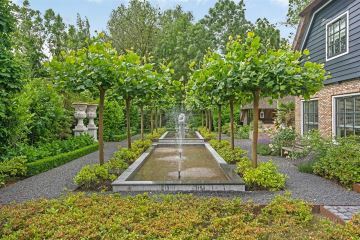 Upon entering the property, the front yard is immediately imposing, with its ponds, antique Spanish lions of pedestals, slate trees and olive trees in terra cotta pots, green beddings and cobble stones. No less than 200 piles have been driven into the ground to support the driveway alone. 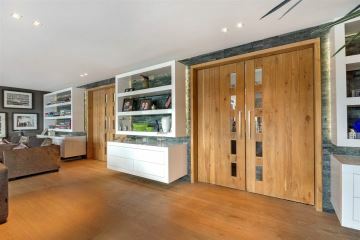 The front door opens to a spacious hallway with on three sides oak wooden doors designed by Piet Boon. 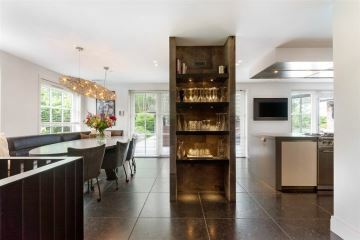 The door to the left provides access to the living kitchen, which might be rather a misrepresentation of this semi-professional environment. 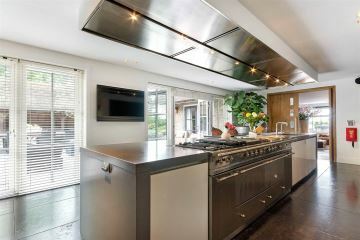 For cooking enthusiasts, this kitchen can easily be regarded as an El Dorado. 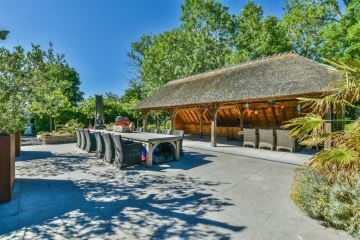 With a huge professional cooking island that does not take away any of the kitchen�s coziness, it has a four-pit stove and a teppanyaki plate, a fryer, a grill and temperature plate, two ovens, a steam oven, a sub-zero wine cabinet, a fridge/freezer combination, a quooker tap and a wood burning stone oven. 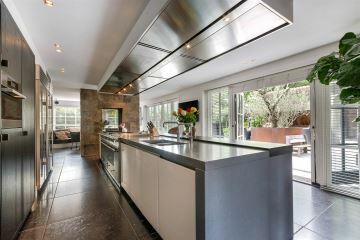 Directly over the cooking island there is an integrated suction ceiling. 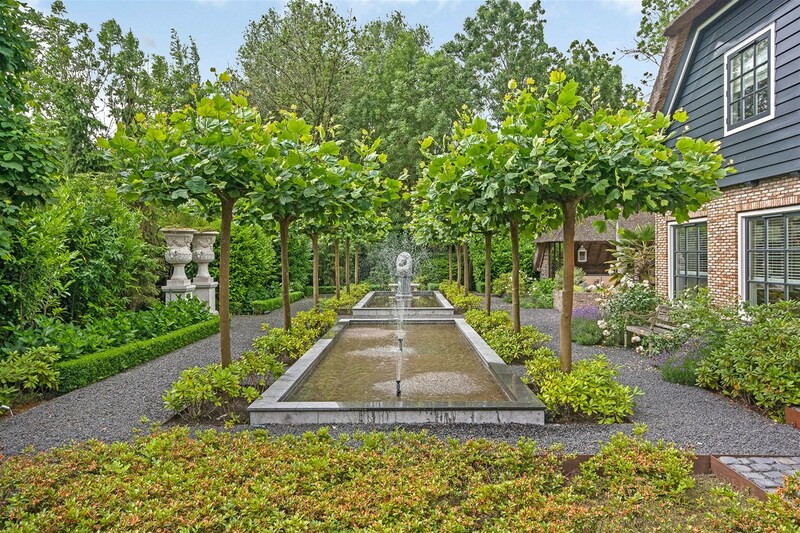 Most of the equipment is made by Keukenhuys de Tweede Kamer and Miele. The ample kitchen space is separated from the dining area by a double-sided gas fireplace with glass walls. The hearth itself is covered in leather, which gives it an added sense of warmth. 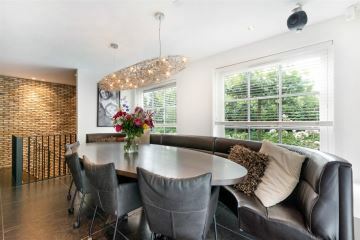 The dining corner has a curved custom made leather couch with leather chairs around an oval-shaped dining table. 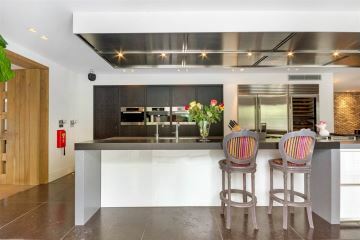 This state-of-the-art living kitchen looks out into the back yard and the floor is of 1m x 1m Belgian hardstone tiles. 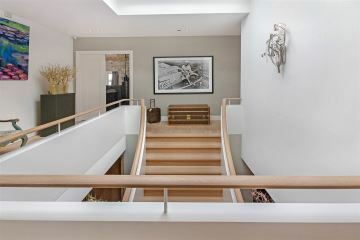 From the hallway � through the oak door on the right, one enters a light work room with custom made oak cabinets, again, by Piet Boon. Also the floor if massive oak. The door in the center leads to what looks and feels like the very heart of the villa. 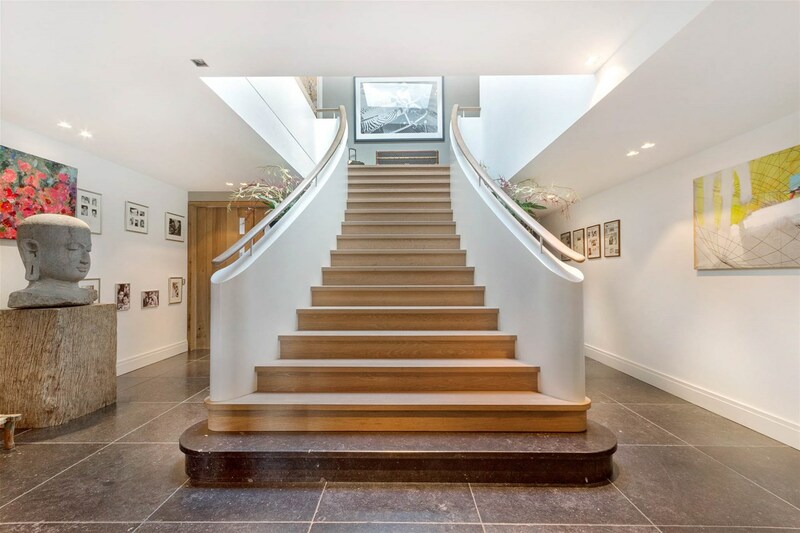 A massively broad oak-wooden staircase fans out and up, and connects the everything together. 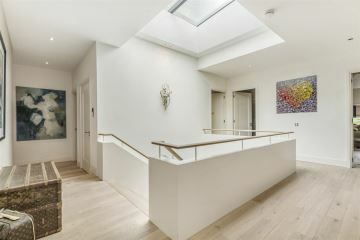 A large skylight illuminates the staircase. 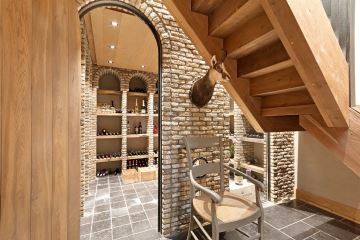 On the right, beneath the stairs there is spacious wardrobe. A spa has been created inside the garage, though it can very easily be brought back to its original purpose. 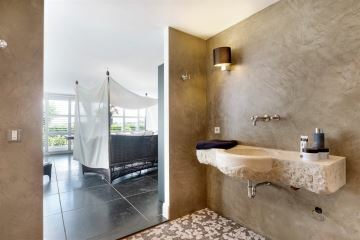 On the side of the garden there is a wellness-suite, with a separate Finnish sauna and hamam with mosaic finish. The walls of this space are partly covered with wood and partly with Portuguese azul (tiles?) 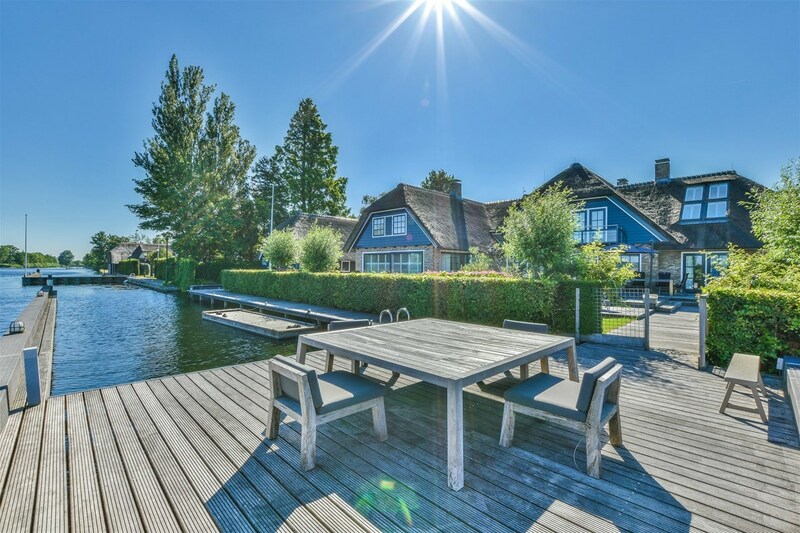 While you relax, you can take in the sight of the Vinkeveense Plassen and its surrounding marshes. 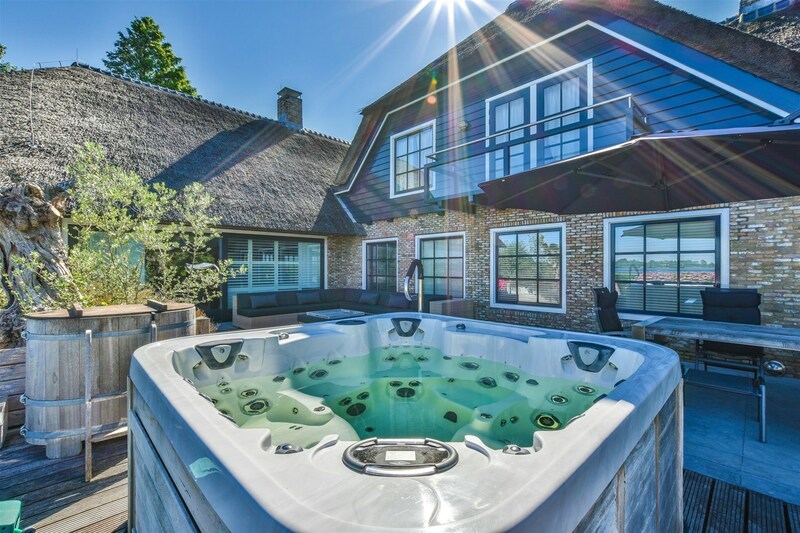 After the sauna, what can be more relaxing than a dip in the plunge pool outside in the grass? 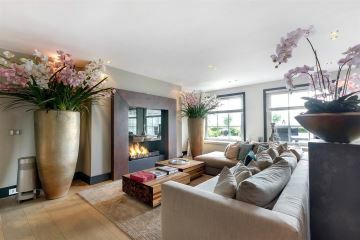 From the hallway, we enter a very light and ample living room, which also contains the house�s third fireplace. 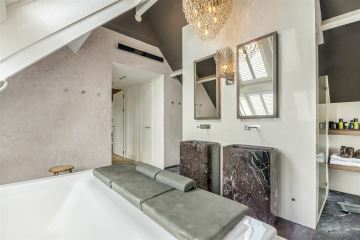 At the moment this space of XM2 is arranged with a double sitting area, which gives it a warm and intimate atmosphere. One of the walls is covered with slate. 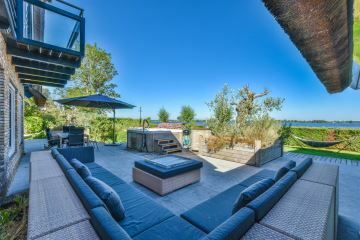 All the storage space is custom made and needless to say that the view of the lake is nothing short of spectacular. 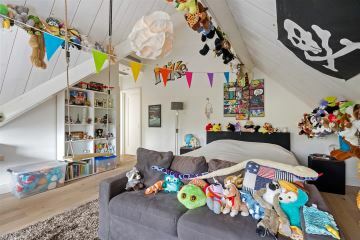 The adjacent room is currently a playing room for the children, but can very easily be made into a separate workroom. 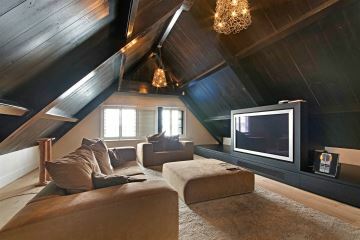 Both rooms are equipped with large LED television screens. 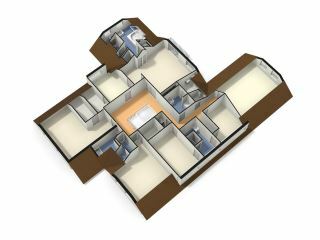 The first floor has no less than five bedrooms and a large home cinema. 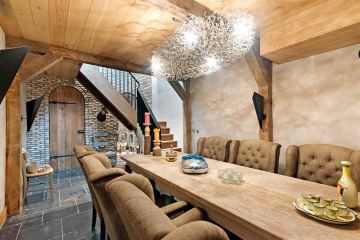 Lamps by Brand Van Egmond decorate the entirety of the first floor. 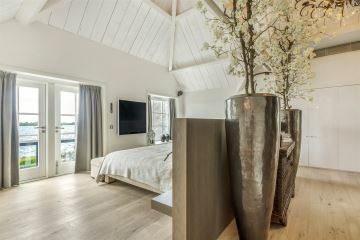 The spacious master bedroom, with its exceptionally high ceilings has a comfortable private balcony and, again, that sumptuous view. 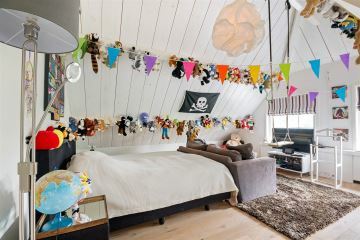 Perfectly balanced, because of a beamer construction inside the bedroom, the atmosphere is both grand and cozy at the same time. Just imagine yourself waking up here! 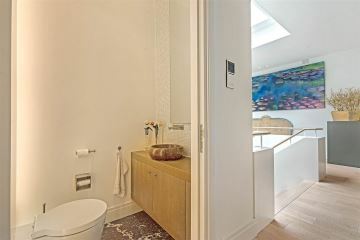 The corresponding bathroom has a large Jacuzzi. The double sink counter top is of Italian marble. 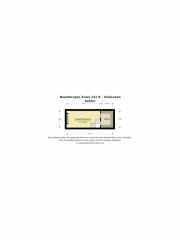 The mirrors, within a frame of pin oak have cup board space behind them and the built-in closets have been conveniently fitted with automatic lighting. 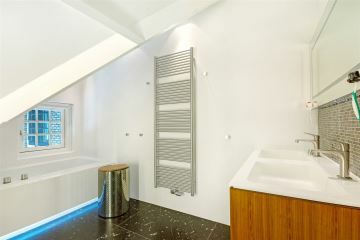 The luxurious rain shower offers space for two and is situated behind a composite wall. 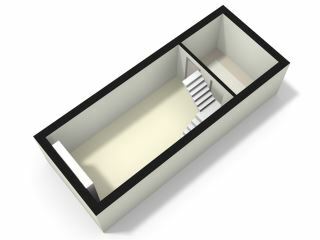 From the bedroom, we enter a double walk-in closet with a small stairs leading up onto an added loft. 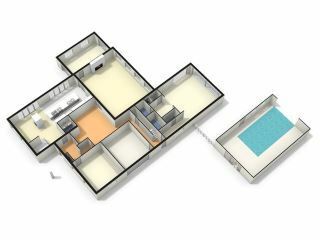 To the right side of the house, there are two bedrooms with a separate bathroom between them, complete with shower and toilet. 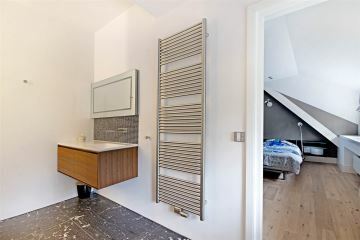 There is a washing room with all the necessary cleaning equipment and a technical space with the boiler. 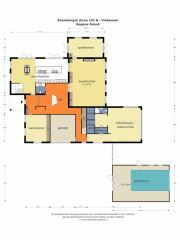 To the left side of the house, there are another two bedrooms with shared toilet, shower and bath. Each has its own walk-in closet. 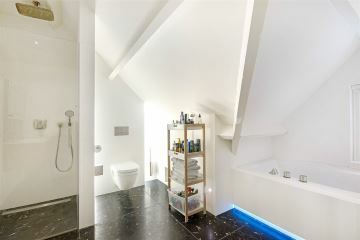 All the toilets on both floors of the house are by Philippe Starck for Duravit. All the sinks are made of granite with custom made rvs faucets. The boat house is true jewel! 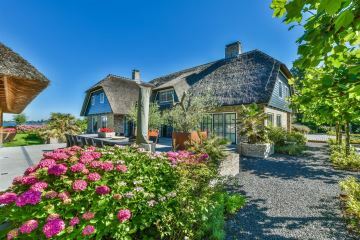 This mini- traditional wooden Dutch farmhouse with thatched roof betrays its true purpose only when its doors have been opened. Inside �lives� a 1964 Riva, which, thanks to the electronic doors, will take you out to open water within minutes. 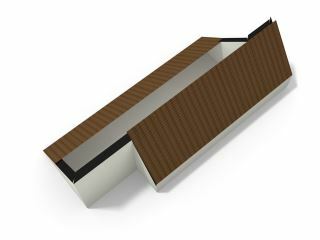 There is enough storage space for surfboards and anything else really that will make life on the water a true pleasure. 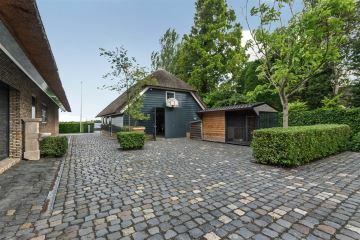 Furthermore, there is a dog house, a large Jacuzzi in the backyard and a tasteful outside kitchen fully equipped with Boretti appliances. 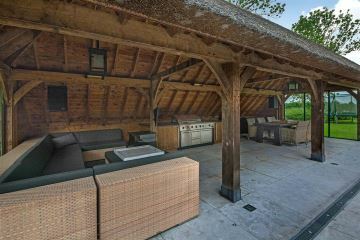 The largest of the many sunny outside sitting areas, has a table with a hard stone top, which seats no less than 26 people. 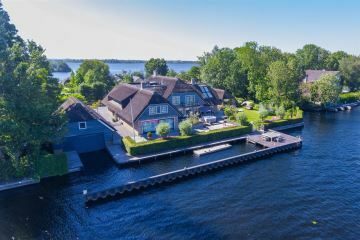 Along most of the width of the backyard there is a hard-wooden jetty with yet another terrace right at the water�s edge, where you can contemplate the summer evenings away on all that which life has to offer. 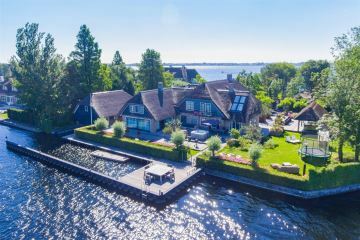 In other words, also this part of this magnificent house lets you indulge � not in Tuscany, the South of Spain or France, but right outside of Amsterdam.